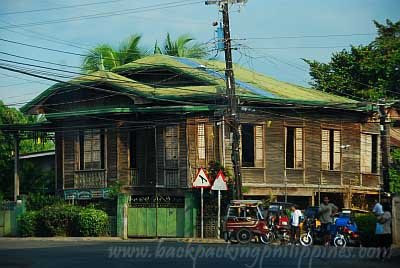 With the museum geek in him satiated, Tutubi, and his two companions proceeded to their destination just around the corner from Balay na Santiago, a quaint restaurant advertising bangus (milkfish) grill and bibingka. 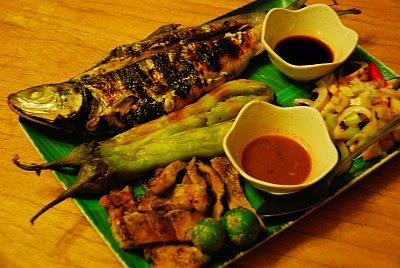 On Bangus, they Genaro's Grill, even with the name grill to the name, serves rellenong bangus, sisig na bangus, kilawin, paksiw and the usual daing na bangus. Typical grill fare of sizzling pork sisig, bangus belly and sizzling squid. 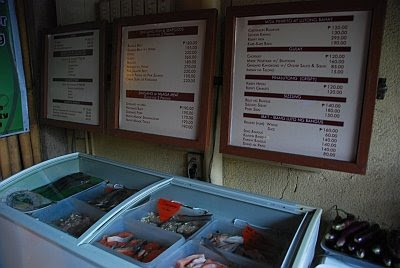 Since they're only three and with limited budget, they just ordered sinigang na pink salmon plus the so-called Genaro's treat, a sampler of inihaw na talong (grilled eggplant), grilled milkfish and inihaw na liempo (grilled pork spareribs) with spicy dips. At 7 in the morning, after taking his complimentary breakfast of daing na bangus, Tutubi checked out of the hotel and drove back to Manila. It's in Santiago City's center that they got caught inside heavy traffic due to an on-going parade that he realized that the city's celebrating the fiesta in honor of San Santiago (St. James whose feat day falls on July 25), the same patron saint of his hometown Paete in Laguna. Traffic was so heavy that even large trailer trucks were forced by the city government to traverse the labyrinthine alleys of the city with so little room for maneuvering. 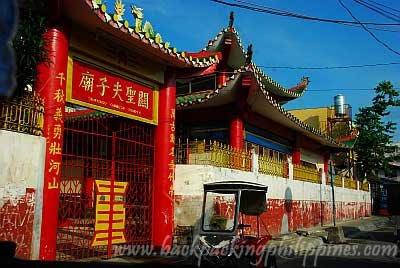 The attempts to evade traffic and find a way out of the city bore positive results when Tutubi stumbled on an old house, bahay na bato architecture, said to be the ancestral house of the Abaya clan while out of an unknown street corner saw a Chinese temple. From there Tutubi retraced the route back to Manila, stopping momentarily again at G&B in Bagabag, Nueva Vizcaya to buy buko pies as pasalubong, searched for the former POW concentration camp in Cabanatuan City and finally a last minute pasalubong shopping at Sevilla Sweets in San Miguel, Bulacan for the famous pastillas. nice eating stories tutubi..btw, zuchinni is not eggplant. i don't know it's equivalent in 'pinas. i don't remember eating any 'local' types. Ang sarap naman nung inihaw na bangus at may kasama pang inihaw na talong? Tiyak pagpapawisan ka sa sarap. Wow food! Sarap naman! Sana makapunta din ako dyan soon. Yum! 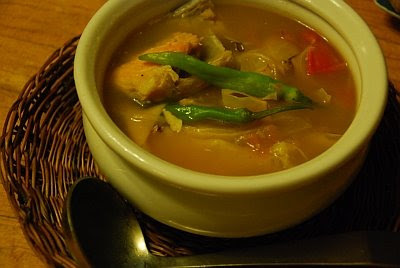 The sinigang na pink salmon looks really good! I like that ancestral home of the Abayas. sarap naman ng set na yon. I got hungry just by looking at your photos! I have been to only one town in Isabela..I think it was Alicia (where the bliss housing is) but that was a long time ago. Very scenic province. Nice pictures as always! The dishes looked good albeit simple. Dennis, didn't have the chance to visit Alicia. One of my close friends is from there pa naman. You could have made the short side trip to Banaue Rice Terraces pala from Solano (around 3 hours back and forth by my estimation). I find that, that place is always great for some peaceful reflection. i'm from isabela (Santiago City). and i don't get to see a lot of blogs/posts about my provice. magan talaga ang santiago..cockfit arena..haha.. Very nice post with very useful information. Thanks for sharing!